BAKER, - (Lieutenant-colonel). 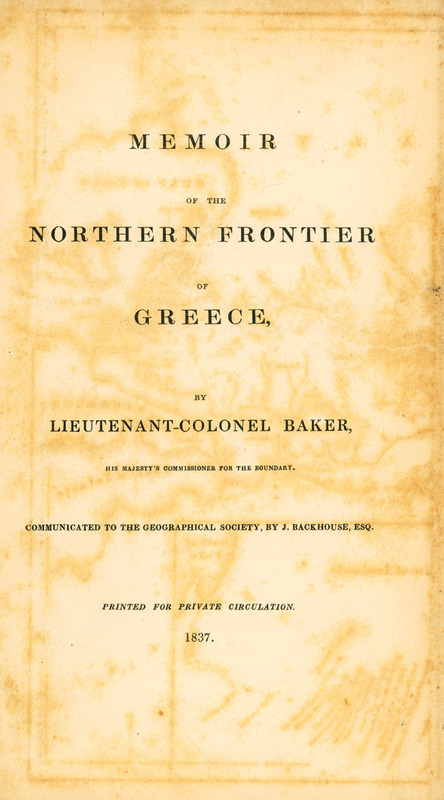 Memoir of the Northern Frontier of Greece, by lieutenant-colonel Baker, his majesty's commissioner for the boundary, communicated to the Geographical Society, by J. Backhouse, esq., London, 1837. BAKER, - (Lieutenant-Colonel). Memoir of the Northern Frontier of Greece by…, Communicated to the Geographical Society, by… Printed for for private circulation, 1837.